Salvete, lectores! I took a long and unexpected hiatus here, but I'm going to try to start posting here again, once or twice a week, my hectic life permitting. So, here is a round-up of today's proverbs and fables - and for previous posts, check out the Bestiaria Latina Blog archives. You can keep up with the latest posts by using the RSS feed, or you might prefer to subscribe by email. HODIE (Roman Calendar): ante diem quartum decimum Kalendas Februarias. MYTHS and LEGENDS: The art image for today's legend shows Orestes and the Furies, and there are more images here. TINY PROVERBS: Today's tiny proverb is: Varietas delectat (English: Variety is pleasing). PUBLILIUS SYRUS: Today's proverb from Publilius Syrus is: Malefacere qui vult, numquam non causam invenit (English: Someone who wants to do wrong never fails to find a reason). PROPER NAME PROVERBS: Today's proper name proverb from Erasmus is Theagenis plurimae pecuniae (English: The great wealth of Theagenes; from Adagia 2.9.6, and it's an ironic proverb: Theagenes was a poor man who boasted about having lots of money, hidden away somewhere). ELIZABETHAN PROVERBS: Here is today's proverb commentary, this time by Taverner: Flamma fumo est proxima: The flame is next to the smoke. This Proverbe teachethe us, that perill and daunger ought in time to be fledde, and that he whiche would eschue evill, must first eschue the occasion of evill, accordinge to our English Proverbe. He that wil no hurt do, must do nothinge that long there to. As for exemple, he that woulde not be evill corupted, let him absteine from the companie of naughtie personnes, he that will not lye with hoores, let him absteine from kissinges and other wanton interteinmentes. 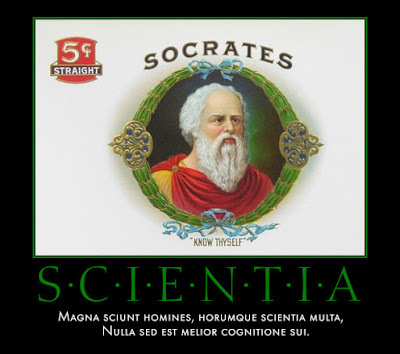 BREVISSIMA: The distich poster for today is Scientia Quae Optima. Click here for a full-sized view. Knowledge is the greatest honor in life. PHAEDRI FABULAE: The illustrated fable from Phaedrus for today is Arbores et Dei, a story about the gods and their favorite trees: Latin text and Smart's translation. STEINHOWEL: The illustrated fable from Steinhowel for today is De rana et bove, a story about a self-important frog: Latin text and English versions. And here's another wonderful Latin LOLBaby: Amicum proba, probatum ama.